→Ten toes longboards – A surf inspired starter’s brand. Ten toes longboards – A surf inspired starter’s brand. Ten toes board emporium is a subsidiary of the company Westridge outdoors – an Outdoor and sporting goods company that make bikes and climbing gear among other interesting stuff. Drawing inspiration from an actual 1960s surf board brands, their surf style longboards reflect the culture and lifestyle of a by-gone era. The simple designs they use are retro, stylish and timeless. They mainly make cruiser boards with a lot of real estate. Having a large standing platform and a huge wheelbase means easy, stable riding that emulates that desirable surfy feel. You can see this with their main longboard line which is the Zed longboards. Coming in at 44 inches in length this board is huuuge, it’s more like a surfboard if we’re being honest. A board of this size is apt for cruising and can even be used for longboard dancing and other longboard tricks. Perfect for those lazy afternoons when you just want to cruise towards the sunset. It might be available on Amazon.com. 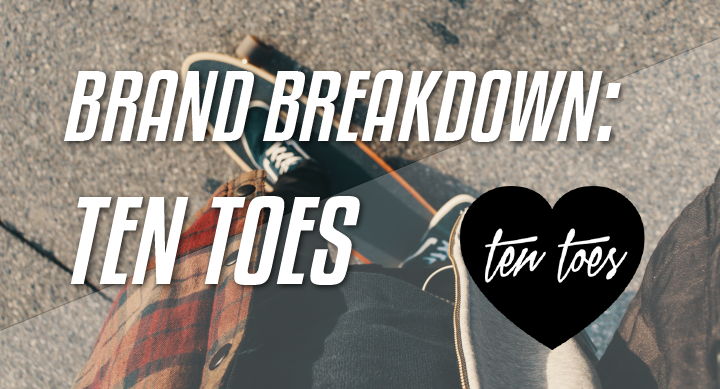 Ten toes also make a drop down longboard and a plastic mini cruiser. The drop-down board is great for cruising and pushing. The dropped platform lowers the ride closer to the ground and this increases stability and makes it easy to push and footbrake. If you gotta commute this is the one for you, but it can also be used for downhill speed skating. You can check it’s price on Amazon.com here. The plastic mini cruiser is small which makes it super portable and easy to store. It is affordable and would make a great present for kids. All these boards are great and are suitable for beginners. Especially if you are starting out, they are easy on the wallet and look really good. The boards – Their Zed longboards are made from sustainable bamboo. Bamboo grows ridiculously fast and looks good when used as a skateboard deck. Bamboo is the most environmentally conscious choice for skateboards. Cutting down Maple or Birch trees is hard on the environment. They grow very slowly, use up a lot of resources and leave a noticeable absence when they are cut down. The decks have simple but beautiful designs and come in various colors, so you can get the one you want. The drop down longboard is 41in long and is made from Canadian Maple for maximum stiffness. The stiffness means more stability and direct rider input when going fast. The plastic mini-cruiser is made from … plastic. This makes it super durable and waterproof and it will probably last forever and ever. It has a waffle pattern to substitute the use of grip tape. The trucks used on the Zed and drop down are the same. These are reverse kingpin (rkp) trucks and are based on the Randal r1 truck – the first rkp ever made! They are built for smooth, controlled turning and are stable up to about 30mph (also depending on your skill level). They are more than adequate for cruising and are very pocket-friendly. They aren’t made from the most expensive materials but they will get the job done well. The mini uses tiny aluminum traditional kingpin trucks (tkp). These don’t turn as much as the rkp but with a setup, that small they are more appropriate. The wheels used are simple polyurethane and in 85a hardness. They come in a standard shape for the drop down and Zed longboards. They are 70mm and 51mm wide. The perfect height for cruising. At 70mm they will roll over road imperfections and produce a comfortable ride, but they won’t be hard to push and will keep good momentum. The mini uses the same but they are smaller to fit under the board and avoid wheelbite. Are ten toes longboards for you? Ten toes are a stylish brand that produces some ethical and environmentally conscious longboards. They are more than adequate for beginners and people looking for simple wallet friendly skateboards that can satisfy their needs. They do not inflate the costs for users and don’t use any cheap gimmicks. However, you do pay for what you get and you will have to upgrade the parts in future if you want to get deeper into any longboard discipline. Here’s our list of the best longboard brands, by the way. I personally would get a Zed longboard, they are stylish and would look good on a wall, cruising around on a warm day or would be a good present for someone wanting to get into skating.